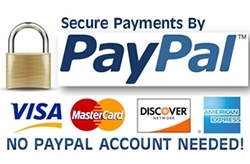 To make a payment to Advanced Fences you can use our easy to use PayPal payment system. You don’t need a PayPal account and all major credit and debit cards can be used. Advanced Fences do not process any of the payments, all payments are handled via PayPal taking advantage of their security systems.